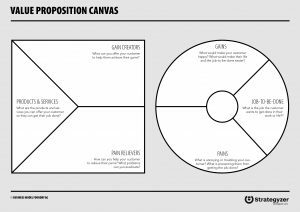 When you want to really understand your customers, the Value Proposition Canvas, developed by Alex Osterwalder at Strategyzer, is one of the best tools available to help you in this regard. 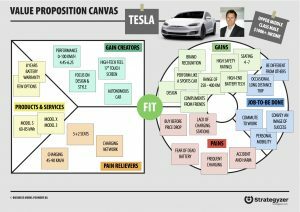 To get started with the Value Proposition Canvas, always begin with the customer. First, have a conversation with your team about who your customer is. Use the Persona Canvas to sketch the person you are focusing on. Once you’ve decided which to focus on, write on post-it notes what jobs your customers have to do. Don’t just think about functional jobs-to-be-done. Also come up with social (work with others) and emotional (feelings) jobs-to-be-done. For instance, when you consider to design a value proposition around cars, is your customer someone who needs to cover a long distance to get to work? Or is your customer someone who undertakes frequent activities with family? These are different people, with different needs, requiring different products to get their job done. Maybe they always drive alone, maybe they have a family or maybe they just want to look good. Ask enough “whys” and you’ll get this info. Pains are usually the easiest to list. What gets in the way of person’s jobs? Gains are NOT simply the opposite of pains. Instead, gains are the hidden ambitions people have, their goals in life, things that make them happy. It takes a designer’s mindset to uncover these. Keep asking better questions, dig a little bit deeper. What does your customer really aspire to do that they can not do now? If gains sound somewhat existential to you, that’s probably because great gains often are. Finally, once you’ve completed the right side of the canvas, move over to the left side. First, list some options potentially address the job-to-be done that come to mind. You combine these ideas into a clearly defined product/service that creates gain and relieves pain such that the job-to-be-done is addressed in a unique way that resonates with your customer. Using this canvas makes you think differently about your customers and what you offer to them. What’s more, done well, your customers will think totally different about why they hired you to fulfill their needs in the first place. In this example there is a fit between the right side and the left side. Tesla understood very well the potential target audience for an electric car. You can see that the job-to-be done is to commute to work. But it is not only about that. Being different from others and convey an image of success is an important social aspect of the job-to-be-done for this customer segment. Besides that, the person wants to be comfortable while traveling long distances. The pains when it comes to electric cars is that there is a lack of charging stations. You have to search for a parking spot that has a charging point. On top of that, pains are that you frequently have to charge your car, and while driving, you can be afraid that you don’t reach your destination. Design, being recognised for good taste and getting compliments from friend are some gains in this example. Other gains are safe travels and high-end battery technology. If we look at the left side at products & services, we see that a Tesla has understood their target audience very well. Beautiful design including a 17 inch screen no car has ever had such large screen. Just a few options, which radiates exclusivity. Besides that, Tesla has 8 years of battery warranty. 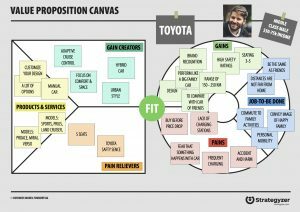 We can say there is a fit between the left side and right side of this Value Proposition Canvas. 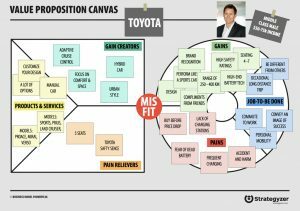 In this second example, you see the Value Proposition Canvas that has a misfit. The left hand side doesn’t match with the right hand side. You can see that the right side is target customer for Tesla, and on the left side you’ll see a value proposition of a Toyota. If you look at the left side of the Canvas, you see that the product, pain relievers and gain creators doesn’t fit with the wishes of the customer. Toyota just build the same cars but then with an accu and this does not solve the problems of the customer. THE FIT WITH A TOYOTA VALUE PROPOSITION. In this example you see the match with a different customer segment. A potential customer with different needs and a smaller budget. I am curious what is going to happen now when Tesla will launch the new Model 3. Will they outperform the traditional car brands? If you are inspired by this tool, check out our other tools here! Download them for free, print them, and use them with your team. Did you already read our book? The book includes the practical step by step guides to bring each tool into practice, and guides you through the entire design journey, all the way from preparation to scaling your business. Patrick is CEO of Business Models Inc. and producer of the worldwide bestseller Business Model Generation. 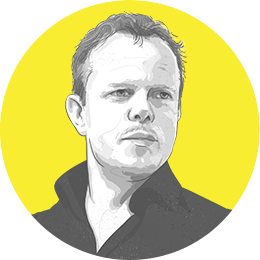 He is passionate to help entrepreneurs, leaders, rebels and corporate companies to innovate their business model and design a future strategy.